Most of the perimeter of the trail system in Orion Oaks County Park was once posted as the Orion Oaks Achievement Trail, a 6.2-mile loop that began at the parking area and trailhead off of Joslyn Road. The “achievement” of this route wasn’t hiking 6 miles, most avid walkers have few problems with that, but the fact that in the middle of Oakland County, generally a beehive of development in most parts, here was a place where you can hike a healthy distance in a completely natural area and backtrack only the first half mile. That is quite an achievement for anybody living in metro Detroit. 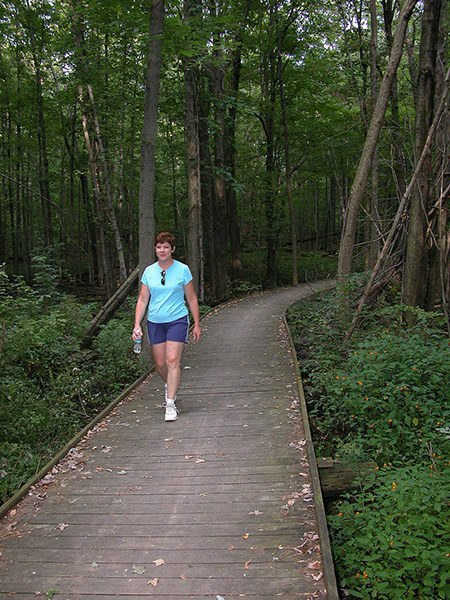 This route is a modified version of the Orion Oaks Achievement Trail. It begins and ends at the Clarkston Road trailhead and cuts out the one-way spur from the Joslyn Road trailhead to post No. 4. This reduces the loop to 5.5 miles, eliminates backtracking, avoids the popular dog bark but still includes all of the park’s most interesting corners, including the impressive pines between posts No. 11 and No. 12 and the backside of Lake Sixteen. You can also begin at a Baldwin Road parking area for a 6-mile outing. On many days there will be as many mountain bikers on the trails as there are hikers and in the winter snowshoers and cross country skiers arrive even though the trails are not tracked and groomed like they are in nearby Indepedence Oaks County Park. Overall these trails are moderately easy. Fast hikers can cover it in 90 minutes. Mountain bikers even less time. But why hurry? On a pleasant day this is a great afternoon outing where there are many places to stop and enjoy the scenery in front of you whether the clear waters of Lake Sixteen, wildflowers bursting in color throughout a wetland in the spring or a partial view from a 1,100-foot ridge in late fall or winter. The Perimeter Loop passes through the Clarkston Road parking area where you will find a vault toilet and a trailhead with a map box. Head east (left) from the trailhead as the trail quickly swings south (left) passes through the wood chip storage area and at Mile 0.3 reaches post No. 2. Follow the route towards post No. 4 as it continues to skirts the woods and arrives at the spur from the Bark Park within a half mile from the start. At post No. 4, this route swings south and skirts a marshy area, arriving at post No. 7 at Mile 1.2. The post marks a short spur to one of the fishing docks on Lake Sixteen. In less than a half mile you pass a second spur to a dock at post No. 9. At either one you can take soak up the scenery or spy on anglers in the middle of the lake trying to hook a trophy bluegill. At this point the Perimeter Loop continues south until its reaches the border of the park where it swings west. You pass the roof tops and backsides of homes of Cedar Key Subdivision, not exactly what you want to see during a hike in the woods, but this is Southeast Michigan. The trail quickly swings north and arrives at post No. 11, at Mile 2.3. Here you head west (left) and use a 120-foot boardwalk to cross through a marshy area past some huge pines that makes you feel like you’re somewhere in northern Michigan, not suburbia Oakland County. The boardwalk leads to Post No. 12 and here you head north (right). The next stretch can be a bit confusing as you pass a pair of trail posts (No. 13 and No. 14) but continue north to post No. 17. By continuing north at this junction to post No. 18 you could be back at Clarkston Road parking area in 0.6 mile for a 3.5-mile outing. By heading west (left) at the junction instead you climb a wooded ridge, passing posts No. 16 and No. 23 and topping off at a grassy knoll st Mile 3.3 featuring a bench, picnic table and even a grill. At 1,100 feet, this “peak” is not only the park’s highest point but one of the highest in the area. During most of the year foilage blocks any view but if the leaves have dropped or it’s early spring you can peer to the north and see Oakland County's other mammoth mountain; Pine Knob, complete with chairlifts. Alpine country in Oakland County. This route continues to post No. 24 where it begins a steady descent, bottoming out at post No. 26. You then head west (right) for post No. 29, reached at Mile 3.7. For the next mile you skirt along the park’s west border off of Baldwin road and then the trail swing east to climb a wooded slope and passing a pair of junctions before reaching post No. 18 at Mile 5. You’re now only a half mile from the Clarkston Road parking area. Orion Oaks is a relatively undeveloped park, especially compared to nearby Independence Oaks County Park. 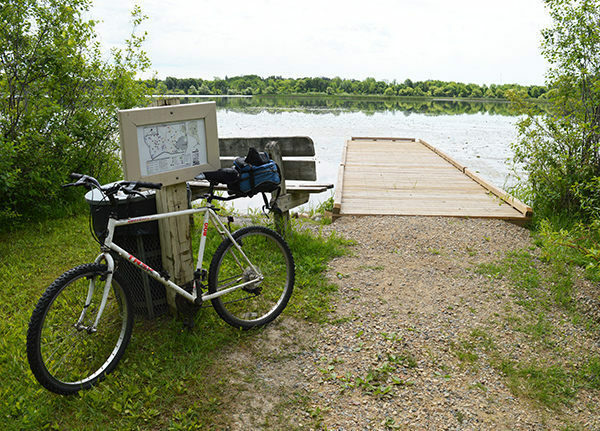 There is a small boat launch off of Joslyn Road for non-motorized boats on Lake Sixteen along with four fishing docks on the lake including one that is wheelchair accessible. Orion Oaks Bark Park opened in 2000 to the delight of dog owners everywhere. It’s now the most popular section of the park. The 14-acre, fenced-in area is one of the largest in Michigan and features two main trails, a field training area, benches, restrooms for people, “poop bags” for their pets. But its most unusual feature is a dog-only swimming area on Lake Sixteen. 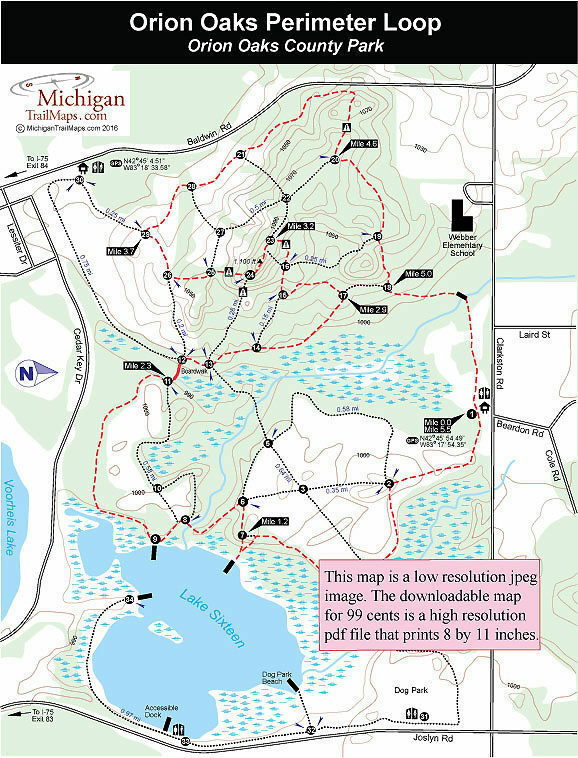 From I-75, depart at exit 83 and head north on Joslyn Road to reach the lake access and trailhead on the east side of the park. Depart at exit 84 and head north on Baldwin Road to reach the trailhead on the west side. Continue on either road to reach Clarkston Road. From Baldwin turn right (east) to reach the Clarkston Road parking area, from Joslyn Road turn left (west). Contact the Independence Oaks County Park (248-625-0877) or the Oakland County Parks website (www.destinationoakland.com).